Thursday, September 12, 1912: Wish some good kind soul would tell me what to write. Grandma, you should have written about the everyday things that you did. . . The things that seemed too boring and mundane to put into the diary. For example, you could have told us what you had for supper. It’s the peak of the apple season—Did you have apples for supper? Maybe old-fashioned apple dumplings. . . .
Preheat oven to 425 degrees. Prepare pastry as directed except roll 1/3 of dough into large rectangle; cut into 3 smaller rectangles. Put 4 apples quarters (1 apple) in each rectangle. Sprinkle with cinnamon. Moisten corners of each square with water; bring 2 opposite corners of pastry up over apple and press together. Fold in sides of remaining corners (as if wrapping a package); bring corners up over apple and press together. Repeat with remaining dough and apples. Place dumplings in ungreased 12 X 8 X 3 inch or similarly sized baking dish. In a saucepan heat brown sugar and water to boiling; carefully pour around and over dumplings. Bake 40 minutes or until crust is golden and apples are tender. Serve warm or cool. If desired, serve with milk. Posted on September 12, 2012 August 30, 2015 by SherylPosted in FoodTagged apple, desserts. 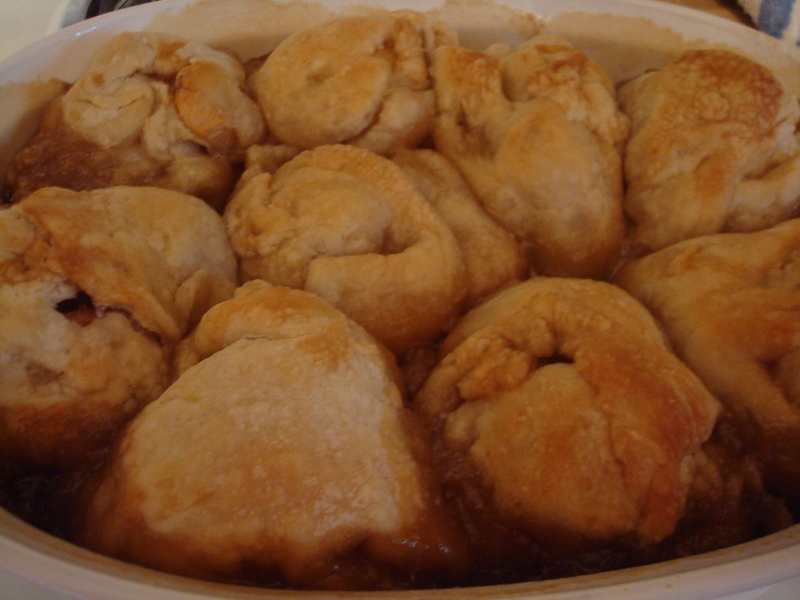 The power of suggestion… I have an uncontrollable urge to make apple dumplings. A perfect celebration into fall. And you are right Sheryl, what sounds mundane today will be a treat for future generations. You’re so right. Apple dumplings are a perfect fall food. I make them once or twice each fall. I love the way you describe this entry. You have a wonderful way with words. Sometimes I wonder what things in my life that seen very mundane will be very different in another hundred years–and which things won’t have changed much. It is time to think of cooking with apples. Thanks for this yummy post. It’s that time of year. So far this fall I’ve made apple crisp, apple pie, and apple dumplings. I rather expect that “writing” was expected to be about “sublime” and “unique” things one hundred years ago…with elevated language. YOu can tell that by the poetry of the time and comparing it with today’s poetry. Using plain every day languge and writing about things as they are is rather a modern concept in writing… And after a full day of farm chores I suspect it was difficult for your Grandmother to find something of that elevated nature. That’s one of the blessings of today’s writing, I think. That makes a lot of sense. It seemed like she wanted to write about “important” things–yet nothing of importance seemed to happen on some days. oh, oh it’s now 1:24 the next night, I’m up again and I’m thinking about those dumplings again, maybe I’ll count sheep…on dumpling…two dumplings…duh! Warm memories here–I loved apple dumplings.The ones we got at the West Shore farmer’s market had a little nugget of solid cinnamon at the bottom, inside. Like a treasure. The nugget of cinnamon sounds awesome. Love apple dumplings, especially when visiting Pennsylvania Dutch country. I love you ranting to your grandmother about what to write. It won’t do any good now, but I enjoy your frustration with her lack of details. I get so involved in the diary that sometimes (and I know this sounds silly), I almost have trouble keeping the times straight. I think that I will make apple dumplings soon. I have made a lot of pies but no dumplings, ever. I think I will start a journal where I just do a sentence or two before bed about mundane things. You are an inspiration. You and your grandmother. That’s a wonderful idea. I’m trying to learn how to look at things through a different lens. Even things that seem mundane are interesting, if I think a little more deeply about them. oh, I just read about keeping the times straight. When I am deep into research and trying to figure out what is happening with some ancestor or friend of an ancestor, I get mixed up too. Sorry, I keep thinking of more things. Once I was working with my own old journals and that was really bad – keeping the times seperate I mean. It’s so easy to do. When I work with old documents, I find that I’m constantly getting new insights and revising my ideas about times, etc.